What a handsome group of cats and dogs looking to be adopted this week from the Humane Society of Jefferson County. 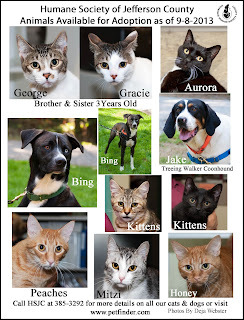 You can visit the shelter, here in Port Townsend, on Tuesday-Saturday from 12-5 or call them at 385-3292. It just takes one person to make a difference & decide to adopt one of these deserving animals.